What is EdgeRank and How Is It Calculated? Whenever there's a need for delivering dynamic content to users, there's a certain algorithm involved. The simplest of these delivers the latest content, as is the case with blogs and news websites, or social networks like Twitter. But that doesn't always cut it, because sometimes, users want more than just the latest news. They want the top and quality content, as is the case with Google Search. And not unlike Google's Search algorithm, Facebook has its own algorithm for ranking posts, and displaying them on your newsfeed. And this algorithm is called EdgeRank. It is the job of the EdgeRank algorithm to make sure that your Facebook Newsfeed gets filled with the most important posts. The algorithm judges the importance of a post for a particular user , be it a status update or a photo, by analysing it through the factors like number of ‘likes’ or ‘comments’ it gets. Its prime objective is to give the most important post the top slot in your ‘Newsfeed’. 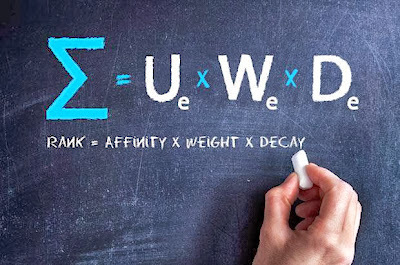 Understanding EdgeRank becomes simple if you get to know few of the terms associated with this algorithm. The calculation of EdgeRank is as shown in the image below. Anything that happens on Facebook is called an ‘edge’. It could be a status update, a photo shared, a comment or a ‘like’. Facebook provides its users with many ways through which they can socialize and express themselves. A user who uses any of these features is actually generating an edge (except for private messages). For example, if I update my status, then I am generating an edge and any user who ‘likes’ my status or comments on it, is also generating an edge. Affinity is the measure of a user’s relationship with an edge. It is calculated by analysing the magnitude of a user’s interaction with the edges of a particular person or a brand. The more you ‘like’ or comment on a person or a brand’s edges, the more you get to see them on your Newsfeed. Even clicking on an edge increases the affinity of a user with that edge. Weight is the fixed value Facebook has assigned to an action on an edge. A user’s action on an edge could be a ‘like’ or a comment on that edge (ignoring it won’t count). It won’t be difficult to understand that why Facebook has assigned more weight to a comment as compared to that of a ‘like’, it’s because comment depicts higher user involvement, while a like is merely a click. This measure helps in keeping your Newsfeed safe from all those posts which had been interesting sometime in the past, but not anymore. Like everything which loses its charm with time, an edge on Facebook also loses its importance with the passage of time. Mathematically, it is calculated by taking the reciprocal of the time of an edge. For an ordinary user, EdgeRank plays an important role in making Facebook Newsfeed entertaining and informative. It helps in getting the Newsfeed filled with content a user wish’s to see on his/her Newsfeed, while making sure that the feed does not contain content already viewed by the user in the past. 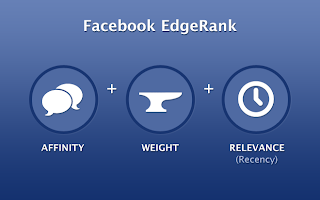 For an advertiser using Facebook for brand promotion, EdgeRank plays a very important role. It helps in measuring the effectiveness of an advertisement campaign. An advertiser can use available tools to calculate the edgerank of the posts on Facebook and then improve his/her edges accordingly. This helps a lot in using the budget allocate for social media advertising in an efficient and effective manner. Hello Qasim! Love your articles as always! You should talk also for those who buy likes for their Facebook pages and how badly it affects their Edge Rank. My Name is Solangi Naeem I am web master I like the way you published your article what a post. Myself opinien you are doing such a good job dear Thank you very much for sharing. Though it was a great informative article but the last part of this article is very useful for me . This article is full of some well-researched information. You have made valid points in a unique way. Thank you for Sharing.